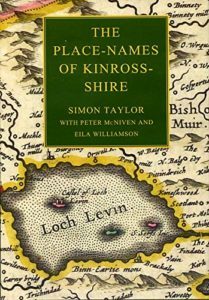 On Tuesday 17th October 2017, the Centre was delighted to welcome Drs Simon Taylor, Peter McNiven and Eila Williamson (University of Glasgow) to 3 University Gardens for the launch of their new book, The Place Names of Kinross-shire. Professor Thomas Clancy had the pleasure of introducing the authors. Frontispiece of Place-Names of Kinross-shire, Volume 7 in the Survey of Scottish Place-Names series. The book is the 7th volume of a much larger (and ongoing) series of studies which survey Scottish place-names. Professor Clancy served as the principal investigator for the project “Scottish Toponymy in Transition” which provided the springboard for the book’s publication, building on Dr Taylor’s five-volume Place-Names of Fife. The volume itself contains a comprehensive analysis and discussion of place-names in pre-1975 Kinross-shire, arranged alphabetically by parish (Cleish, Fossoway, Kinross, Orwell and Portmoak). In addition to this the book has detailed appendices, including a useful glossary of all the words or elements found in the place-name corpus, and a full calendar of previously unpublished/untranslated documents relating to the abbey (later priory) of Lochleven up to the early 15th Century. Dr Taylor pointed out that—much to his dismay—many of these documents no longer exist in their original form. Indeed, many were Latin translations of the Gaelic originals which, nevertheless, still exhibit a profound Gaelic influence. In terms of structure, the main body of the book in split into three parts. Chapter 1 deals directly with the geography and geology of the historic county; chapter 2 with the administrative history and evolution of the region over time; chapter 3 deals directly with the place-name evidence. This sheds light on the invaluable linguistic evidence these provide for the history of these countries, and the communities that inhabited them. The vast majority of place-names in Kinross-shire are of Scots and Gaelic origin. Each contributor offered a few words about their findings, and the process involved in such an ambitious study. Simon Taylor extolled the joys of place-name studies, sharing with us some of his favourite discoveries. This included the Shoggle-Boggle Well which, despite sounding comical and peculiar to modern ears, once served as a march-boundary between two historic estates. Indeed, the 18th Century saw the true location of Shoggle Boggle Well occupy the agenda of the High Court in Edinburgh, as landowners hotly disputed the demarcation of their estates. Other highlights include Dr Eila Williamson’s favourite place-name: a location which—despite being situated in the middle of a modern-day wood!—is dubbed “The Tree”. This reveals the remarkable longevity of place-names, which can often defy long-term changes in landscapes. Dr McNiven shared with us the often rage-inducing aspects of trying to fit detailed maps onto page leafs as small as 7×4″. This pertained particularly to the boomerang-shaped parish of Fossoway. In the end they settled on 5 detailed and illustrative maps, which will be instrumental to future scholars. Finally, at the pub after the talk I got a chance to ask about a place-name that has always puzzled me: the illustrious Royal Burgh and port of Burntisland in Fife. As my father hailed from Burntisland, I spent quite a bit of time there when I was younger and was always struck by the fact that it was (1) not an island and (2) not burnt. Dr Taylor quickly set me right. Unlike many other place-names—which can have complex and multi-layered origins—this was exactly what it said on the tin! Prior to the area gaining Royal Burgh status, granted by James V in 1541, there was likely a fire on the small islet which was eventually incorporated into the port. Despite royal intentions of naming the burgh “Graceport”, the nickname stuck in the popular imagination and thus gained enough currency to remain the name of the burgh and parish to this very day. If you are interested in purchasing a copy of Simon, Peter and Eila’s book, it is available through Amazon here. Our next seminar on 24 October features Carole Hough (Glasgow), who will be discussing her work on the early history of the English language in Scotland. We Hope you will join us.